Looking for that perfect something to top off your Shoshana Lonstein pleated cuff shorts and Stella McCartney wedges? How about a Cloris Leachman muumuu? Right answer: Hell yes, please. 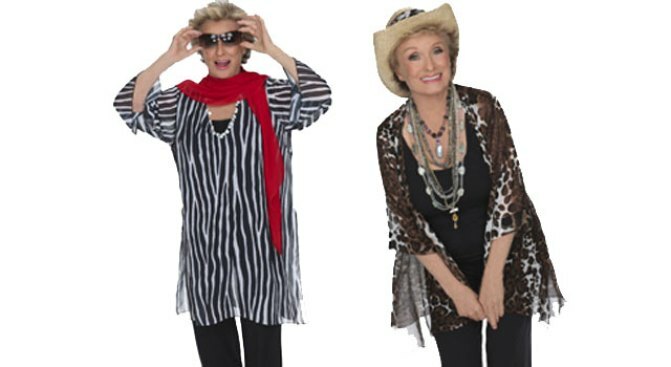 "Dancing with the Stars" contestant and "Mary Tyler Moore Show" legend Cloris Leachman, 83, has launched her own clothing line: Clorisline. Her summer set features a selection of "vibrant florals with a dash of safari sophistication." "What you wear is how you announce who you are -- and to me, too many American women look like members of a penguin community ... so stand tall, ladies. Here are some views of what I firmly believe you’ll want to be wearing," said Mary's TV landlord. And what exactly should you be wearing? Cowboy hats with turquoise or animal print embellishment, to start. Click here to get schooled by the Leachman.